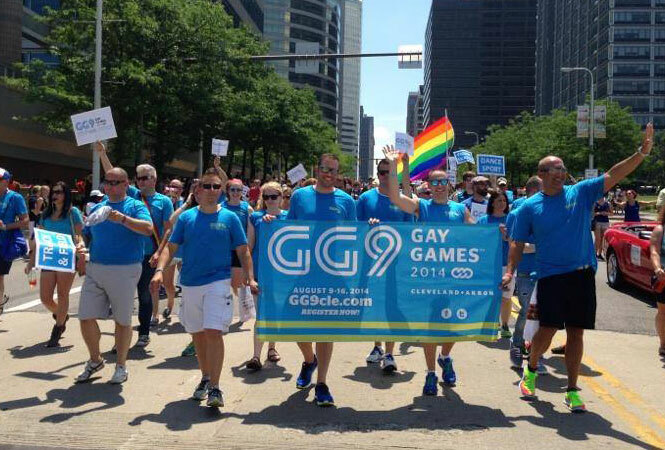 Gay Games 9 organizers march in June’s Cleveland Pride parade. RuPaul fan favorite Pandora Boxx will be the host all week at the Games’ Downtown Cleveland Festival Village, a gathering spot with free entertainment where they’ll recognize medal winners. The Games are expected to pump tens of millions into the Northeast Ohio economy. Hotels are booked, and non-gay venues are hosting events for LGBT visitors. Arts groups have scheduled performances with LGBT themes to attract the Gay Games audience. But the event hasn’t come together without a hitch. The original host committee was replaced by the Federation of Gay Games in 2010 after being accused of breaking its contract. Earlier this year, at least 17 Cleveland cab drivers quit their jobs after refusing to drive vehicles advertising the Games. The LGBT Community Center of Greater Cleveland and the Community AIDS Network/Akron Pride Initiative have been part of cultural-competency efforts to educate businesses about serving and working with LGBT people. And not all have been enamored with the idea of spending a week outside the world’s gay meccas. Nobbe said organizers are expecting closer to 8,000 participants rather than 10,000. He said they still expect about 20,000 spectators, though. On the financial side, though, the Games have drawn the first-ever presenting sponsor. The Cleveland Foundation’s $250,000 donation changed the official title of the event to Gay Games 2014 Presented by the Cleveland Foundation. The money includes funding for a post-games legacy fund that will aid Cleveland’s LGBT groups with annual grants into the future. “It will help the Games be more than a single event,” said Kaye Ridolfi, the foundation’s senior vice president for advancement. Participants at the Gay Games will include people from India, Liberia, Malaysia, Nigeria, Sri Lanka, Trinidad and Tobago, and the United Arab Emirates, where homosexuality is outlawed. There are also participants coming from Russia, where the debate over a new anti-gay law has brought an increase in violence directed at LGBT people.